Today the sign out front says "Acorn Hull House." I've also heard it called the Zebco House (aka Zero Electric Bomb Company, an oilfield business that later became a famous maker of fishing reels). The rumor goes it was built for a Zebco executive and designed in the shape of a fishing reel. From above the home does have the shape of a fishing reel- as in round- but beyond that I don't really see that much resemblance. It definitely has the look of a Frank Wallace design with that Klingon inspired skylight. But the Tiki-esque look also suggests a Blaine Imel. No matter who is to responsible, they did a great job creating a unique and fascinating exterior. Now if we can just get a tour of the inside! 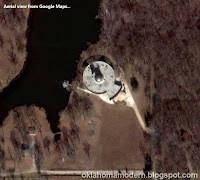 This unusual house is located off US-412 near the McClellan-Kerr Navigation Channel. Planned highway expansion could adversely affect this unique structure. I've driven down 412 hundreds of times and had no idea such a place existed. Thanks for posting this. That's a full half-mile north of US 412. Unless they're planning to reroute the highway I don't see how the home would be endangered. The picture blows up nicely. That is really cool. "Unless they're planning to reroute the highway..."
An overpass and exit ramp for access to Port 33 is being planned. I don't know the details but an adjacent home is supposed to be coming down to make way for it. Hopefully it doesn't come anywhere near this gem. This is my late step great grandmother's house and indeed it was designed by the late Frank Wallace. Mr. Wallace was also the architect for Oral Roberts University. "..and indeed it was designed by the late Frank Wallace." Wallace isn't dead. But when I asked him about this house in 2010 he claimed he did not design it. He is old though so maybe the years have fogged his memory? I'd love to know more Anonymous! It was my dad Cecil Stanfield that designed the home! I believe it's a Cecil Stanfield house. He lived in Tulsa in a round house he designed. He was an architect, and raised orchids. His buildings around Tulsa include the Abundant Life Building and John Knox Presbyterian Church. He also designed some of the buildings at ORU. My father, Cecil Stanfield, designed this house. He was the principal in Stanfield, Imel and Wallace, architects... so Frank Wallace remembers correctly that he did not design the house. This was my grandparent's house, RD and Lu La Belle Hull. It was built from 1969 - 1971. The dome over the pool was originally going to open but he was afraid that it would get "stuck" open and changed his mind. I recently found some of the early elevation view drawing of the house including a similar version of the round design. The original estate was 260 acres and had three man made lakes stocked with all kinds of fish. My grandfather would take us around the main lake in the evenings to fish. I haven't really fished since he passed in 1977. There are several places around the property where Zebco reels are buried. When a reel came in for repair, they sent a new one instead of repairing it and those reels ended up in ditches and buried. I would spend hours in those "tresure pits" playing and building reels. Great memories. I am pretty sure I have film of that house under construction. Thanks for posting this. is amazing and I love it.